FROM THE BESTSELLING AUTHOR OF LIZZIE'S SECRET. LONDON 1940. A gritty, heart-warming and wholesome drama about surviving against the odds. Perfect for fans of Katie Flynn and Nadine Dorries. 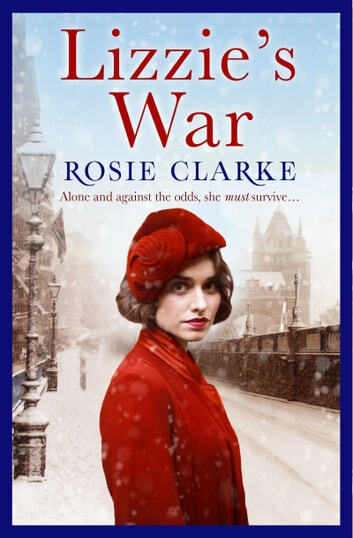 Against the devastating Blitz of London, normal life must continue for Lizzie Larch. With Sebastian returning to war, Lizzie must make a success of her business in order to survive and care for herself and her young child. Silently from the shadows, her secret enemy watches and waits, threatening to ruin Lizzie and everything she holds close. Battling against shortages, her hats become more popular, but what of the man she loves? Will he ever return? What Lizzie knows now is that success can mean nothing without love. 'Another GREAT READ from Rosie Clarke. Loved this book? Rosie Clarke's next novel, JESSIE'S PROMISE, is avaliable now. Search: 9781784977177. Rather slow moving at the start but became more interesting as the plot moved on. however rather predictable story line. I am really enjoying the series . I cant wait to read book three. Lizzies Secret & Lizzies war were great now Lizzies daughters. Intetesting story about the lives of british people during ww2.